Making a fully lined and structured tote style shopper with lined pocket. Making a full-length cookery apron featuring frilled hem, curved clean finish seams, darts and faced edges. Making a quilted apron to hold all your sewing equipment, featuring three pockets, a fitted waistband, covered buttons and machine worked buttonholes. This workshop is repeated each month so if you’re spoiled for choice you can choose another next time to round out your sewing skills! All materials supplied. Our sewing machines have a speed control, in addition to the foot pedal so that students feel completely at ease and can adjust the speed to a level that they’re comfortable with. This quickly instills confidence, which is so important in developing a new skill. General sewing equipment and haberdashery is available to purchase at the school. Pins, scissors, tape measure, unpick, sewing gauge and thread are generally all that’s needed to start with. Fabric and thread is supplied in this course. We are ideally situated just minutes from M6, M61 and M65 motorway junctions in Farington and have excellent spacious ground floor facilities and free car parking. 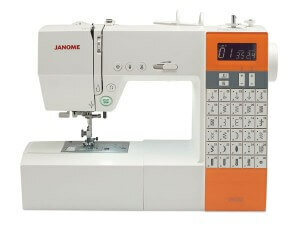 As well as our quality modern Janome sewing machines and overlockers, we have excellent pressing equipment from Philips and raised cutting areas to save your back! 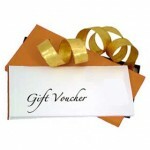 Small classes and expert tuition ensure that you will complete your course with confidence. Join this popular workshop to start your journey on a life time of fun and creativity! To book your place, select ‘make booking’ submit your details and bank transfer details will be emailed to you. I really enjoyed the beginners sewing course. I’m not practical at all, but even I managed to make a well finished and sturdy apron. Janet manages to fit loads of techniques, hints and tricks into the day so I’d feel confident in starting my own projects at home. Well worth the course fees, once I’ve had a bit more practice I’ll be booking in again to learn how to make patterns fit! I had a fantastic day on the Sewing for beginners course. 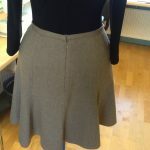 It was really satisfying to be guided through making a functional garment. I felt confident with using the machine because of the great way all the processes were explained step by step. I would highly recommend the course and I can’t wait to sign up for a longer course to improve my skills. Highly recommend the course for beginners, having never used a machine before I was given the confidence to just have a go. Very satisfying to leave at the end of the day having actually made a wearable apron, now I want another go to see if I can improve on it! Would definitely recommend to anyone who has always fancied trying it but not known where/how to start. Thanks to Janet for her guidance and knowledge! 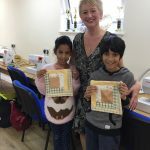 Had a fantastic mother and daughter day at the sewing for beginners day. A great way to introduce a complete novice like me in to how enjoyable sewing can be. And a good refresh for my mum who has been sewing for years. Highly recommended!! 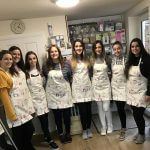 Thank you Janet for a wonderful day yesterday ( 21st Nov 15 ) I had a fabulous time making my cooking apron and certainly intend to carry on with my new “hobby”. I will definitely be back for some more classes! 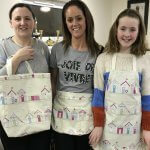 Thank you so much for a fantastic sewing-for-beginners day on Saturday 23rd Jan. I thoroughly enjoyed learning what, for me, was a completely new skill, as I am ashamed to say, I had never sewn before I attended! 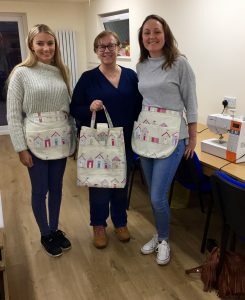 Janet has completely inspired me to continue my mission in learning to sew and I came away feeling a huge sense of accomplishment having produced my own sewing apron. Thank you for giving me the confidence to know that anyone can have a go, even if they are a bag of nerves beforehand! Love my new apron! Thanks for a great day on the sewing for beginners on the 16th April. I’ve done a small amount of sewing in the past but had to pick it up as I went along so I thought it was time to learn the basics. I was little concerned when I arrived and found that the abilities were mixed in the room but there was no need. Janet moved between everyone seamlessly and seemed to know when she was needed and the others were welcoming and supportive. I left that day with a lovely bag and the basics in place. I’ve deliberately held off reviewing as I wanted to test if I’d remember anything when sat in front of my sewing machine by myself. Well, today I had a go at making a cushion cover from scratch pretty much making it up as I went along. While doing it I used the skills learned on the day but almost more importantly I used the little tips you won’t necessarily figure out yourself. Definitely worth going on this day.